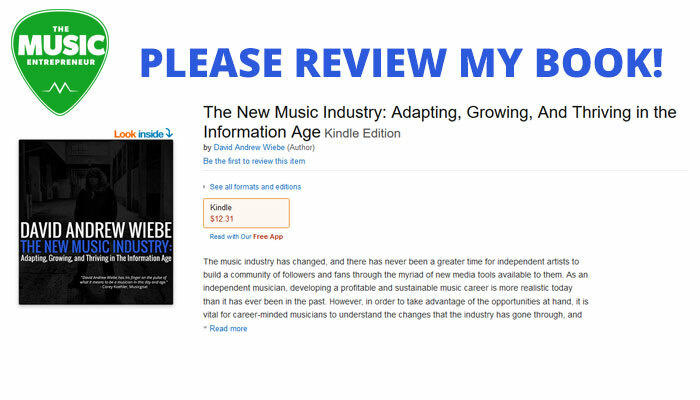 Have you had the chance to read my new book, The New Music Industry: Adapting, Growing, and Thriving in The Information Age yet? If so, first of all, thank you. I really appreciate you making the purchase. But I believe the book and the music entrepreneur message needs to reach more people, and while I am doing everything in my power to get the word out there, there’s one thing I simply can’t do without your help. I’m not looking for anything crazy. If you’ve read reviews on Amazon before, you should already have a pretty good idea of what I’m expecting. Most of them are just a few sentences long. So yes, I do know that I’m asking you to take a moment out of your day to do this, but you don’t hear me asking for things that often. In fact, my natural tendency is to give, give, and give some more! For whatever reason, Amazon reviews really do make a huge difference in a book’s online visibility. I don’t make the rules, but in this case I have no choice but to follow them. If the book or this website has added value to you in any way, I would ask you to go to Amazon now to add your thoughts right away. And I’m not looking for testimonials either. I already have a lot of great feedback from industry connections and colleagues. Your honest, candid opinion will do just fine. Please review my book! Thanks for hearing me out on this. Let’s get this message out there together.